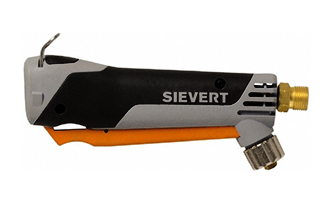 PRODUCT: Sievert Promatic #3366 Universal Torch Handle with Piezo Ignition, instant On/Off Function, 22 - 58 PSI Propane Gas. Price/Each. Used with smaller burners / torches. SIEVERT LSK2-30 BASIC SOLDERING IRON KIT, WITH #3366 SIEVERT PROMATIC UNIVERSAL HANDLE AND #7003 SOLDERING BURNER, STAND, #7004-00 14 OZ. PYRAMID COPPER BIT, 25' UL LISTED HOSE, 3091-23 UL PRESET LP REGULATOR. PRICE/KIT. Sievert RKD-4 Hot-Air Propane Powered Torch Kit. For Modified Bitumen Membrane Repair. Uses Disposable Propane Cylinders. Price/Kit. Sievert RKH-4S Hot-Air Propane Powered Torch Kit. For Single Ply Roofing Membrane Repair. Uses Disposable Propane Cylinders. Price/Kit.